RETIRE IN STYLE BLOG: Keep that Sense of Humor...living with old age! Keep that Sense of Humor...living with old age! This post on Joanies Ramblings made me laugh....hopefully you will like it. 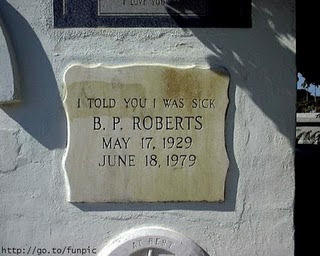 It is called "What Kind of Tombstone Would I Want?" This is just one choice...and definitely not the best. It will tickle your sense of humor!